Hours after Rep. Ilhan Omar released a statement reporting death threats following a tweeted attack from President Donald Trump, the President Trump again tweeted about Omar, saying: “before Nancy [Pelosi], who has lost all control of Congress and is getting nothing done, decides to defend her leader, Rep. Omar, she should look at the anti-Semitic, anti-Israel and ungrateful U.S. HATE statements Omar has made. She is out of control, except for her control of Nancy!” The President visited Minnesota on Monday to talk about taxes in a district that neighbors Omar’s own. Omar commented on the president’s visit on Twitter saying: “The Great State of Minnesota, where we don’t only welcome immigrants, we send them to Washington.” Omar is a Somali-American refugee. 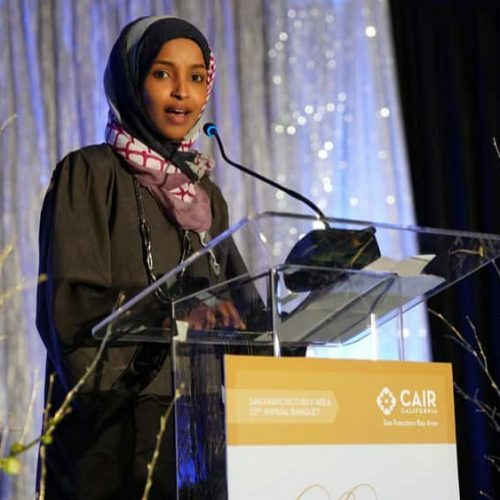 Democrats came to Omar’s defense after Trump tweeted out a video Friday, sequencing a clip of Omar speaking about 9/11 during a CAIR speech last month with disturbing footage from the attacks on the World Trade Center and the Pentagon. Omar said in a statement Sunday evening: “Since the President’s tweet Friday evening, I have experienced an increase in direct threats on my life—many directly referencing or replying to the President’s video. I thank the Capitol Police, the FBI, the House Sergeant at Arms, and the Speaker of the House for their attention to these threats.